Playtime in Africa is on the radio! Board member and international representative Amowi Phillips, along with volunteer Rachel Phillips, sat down with the hosts of Creativity in Play to discuss the inspiration behind Playtime in Africa, reconnecting with our Ghanaian culture of play, and why it’s so important to design cities with children in mind. Listen to the archived interview here! 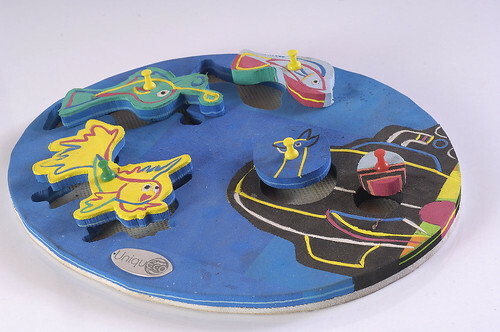 Creativity in Play is hosted by Mary Alice Long, PhD., and Steve Dahlberg, in partnership with the International Centre for Creativity and Imagination and the National Creativity Network. The show explores the importance of creativity, play, and imagination across societies. Want to learn more? You can access all archived episodes of Creativity in Play online! The Anancy Festival celebrates the global importance of Kweku Ananse, the cunning spider-man whose roots lie in West African folklore. This year it was held simultaneously in Ghana, Jamaica and five locations in the US. Needless to say, Mmofra got heavily involved with the Accra event – check out our full report, which includes some fantastic pictures. For our pins, we’ve chosen a modern ‘Anancy’ book from a Jamaican-American author and an older ‘Ananse’ book from a Ghanaian author. Anancy’s Family Reunion is the work of writer and Socamom blogger Eva Greene-Wilson, who hosted the Washington, D.C. edition of Anancyfest. Instead of retelling older stories, the book creates an original one in the Jamaican tradition. It is available through Amazon in both print and digital formats. S. Y. Manu’s Six Ananse Stories collects several classic Ananse narratives, and was published here in Ghana in 1993. Like may older Ghanaian publications, it is now a rarity – we found second-hand copies on sale for $40 and over. Together, these two books show that the Anancy/Ananse tradition includes many different interpretations, and has room for new ones too. That’s just one of the reasons why it continues to thrive. See you at Anancy Festival 2014! Follow our Everything Ananse Pinterest wall for book covers, illustrations, videos and more. On June 8, over a hundred children at Mmofra Foundation’s language club welcomed “Jamaican Anancy”, on a “visit to Accra” to reconnect with his cousin Kweku Ananse! Children’s activities on this busy afternoon included making and flying their Jamaica – Ghana paper airplanes, and autographing a big map locating the two countries across the Atlantic Ocean. Maisie Howell, also an organizer and animator of the Accra event, joined Ruth in a spirited introduction in which children learned words and songs in Jamaican patois. Before a large backdrop of the Atlantic ocean, Auntie Ruth and Auntie Maisie did a splendid job helping the 110 children present understand the historical and cultural connection between Ghana and Jamaica. After 500 eventful years, they said, Jamaican Anancy has gotten tough, resistant and even more wily! Yet the cultural similarities were clear as an Anancy/Ananse story from each tradition was told. Auntie Maisie performed a variation of the well-known Bre Anancy and Tiger test of wits, and Benjamin Kwadey, a veteran actor of the national drama company gave us a less typical Kweku Ananse story. Putting it all in the original traditional context of “Anansegoro” (Ananse Storytelling) were Mmofra Foundation’s in-house master storytellers and performers Ama Buabeng, Akua Florence, Kwabena Ntow, Major and Okyere. If the attentive listening, the busy signing of the huge map and the enthusiastic learning of Jamaican songs and games are any indication, the celebration of Anancyfest in Ghana is off to a great start as it joins an increasing number of worldwide venues! At Mmofra, we’ve been committed to showing children how their cultures have become international. Our Pinterest board of “Everything Ananse” will continue to be a resource for children and adults interested in all aspects of Ananse folklore. A big- up to the Jamaican community in Accra who put a lot of effort into organizing, documenting and participating in this event! Some images in this post courtesy of the Anancyfest Facebook page. Hot on the heels of our post about Spider Stories, here’s another up-and-coming animation team with its roots in Nigeria. We looked up Sporedust’s work on Youtube after spotting an interview with them in The Africa Report. Their key video is the short one above. It introduces Chicken Core, which is the team’s flagship creative project. However, the mysteriously-titled video clip ‘Act 1 stitch‘ suggests Sporedust Media also has an eye on young adult audiences. Although you can detect the team’s passion for Asian animation in Chicken Core, both clips have a distinct African influence. Here’s what Sporedust’s Shina Ajulo had to say about it in the Africa Report interview. Like the creators of Spider Stories, Sporedust are hoping to make their story into a full-length film or a TV series. The race to become ‘Africa’s Pixar’ is on, and we’re enjoying every minute. Find more African cartoons and graphic novels on our Animated Africa Pinterest wall. A top tip for those who don’t already know: the graphic novel series Aya has been made into an animated feature film. The original books offer a wonderfully honest and detailed look at growing up in Abidjan, and the film is no different. Author Marguerite Abouet and artist Clément Oubrerie directed it themselves. We’re huge fans of Aya and hope the film will win it some new readers. Take a look at the trailer below. For more African ‘toons, check out our Animated Africa for Kids and Teens wall on Pinterest. 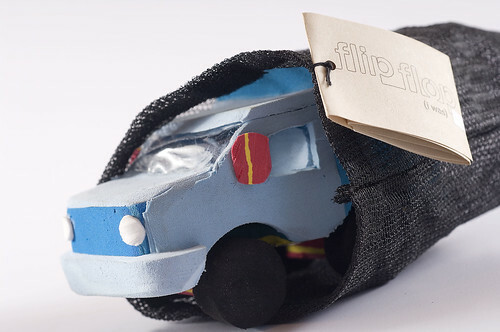 Our last ‘Fida Finds’ post featured Ocean Sole, a Kenyan company that makes cool products out of washed-up flip-flops. We had some great photos of their toys and sculptures, but now Ocean Sole has sent us some shots of the production process. You can read the company’s story and browse its catalogue of products at ocean-sole.com. 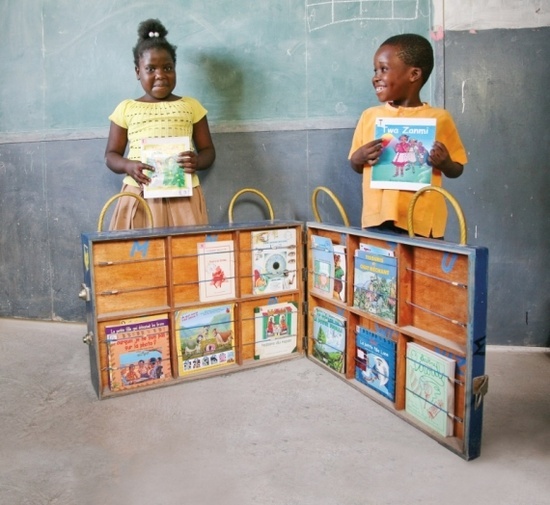 Plan Canada began selling these portable book packages for Haitian schools following the disastrous 2010 earthquake. Hopefully it came stocked with a good mix of books about Haitian life and by Haitian writers. Unfortunately there is no detail on its exact contents – if you know more, do leave a comment below. Books are wonderful things, but ‘gifting’ them from far away isn’t as straightforward as it might seem. Which books will they be? Who decides what the recipients should be reading? To us, ‘appropriate’ content means stories that are meaningful to young readers. Books with characters, environments and situations they can identify with. We’re big believers in putting local literature into children’s hands. Stories from elsewhere are great, but nothing gets a new reader engaged and excited like seeing their life reflected on the page. Here in Ghana, the global literacy charity Worldreader distributes Kindles and ebooks to some schools. We have supported (with a bit of constructive criticism!) its efforts to offer more local content – take a look at the catalogue and you’ll see a growing number of African originals. You’ll also find our own ebook of Voice in the Forest, by Mmofra founder Efua Sutherland. Positive stuff, but there is always room for improvement. If you’re looking for some African children’s literature yourself, our Pinterest walls are the place to go: we regularly pin new recommendations to our Young Adult and Kids reading lists. Have you ever found a lost or discarded flip-flop? We’re willing to bet the answer is yes. These cheap, practical shoes are worn all over the world, from Californian beaches in the US to downtown Accra here in Ghana. Ghanaians call flip-flops chale wote, which translates as “My friend, let’s go” – a very poetic way to describe their slip-on-and-go appeal, if you ask us. The phrase has even inspired an annual street art festival in Accra. Unfortunately, chale wote can make a mess. They come off easily and wear out quickly. All too often, they end up as trash in a public space. In coastal areas the problem becomes even worse. The world’s oceans are full of plastic waste, and that includes flip-flops. Lots of them. Many are washed up on the beaches of Africa, where they spoil scenery, harm wildlife and affect local industries such as fishing. 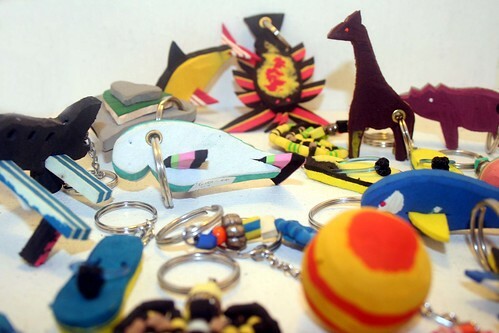 In 1997, a marine conservationist named Julie Church saw children on Kenya’s Kiwayu island collecting colorful flip-flops and turning them into toys. Over the next 15 years, she helped turn the children’s instinctive ‘upcycling‘ into a community business. 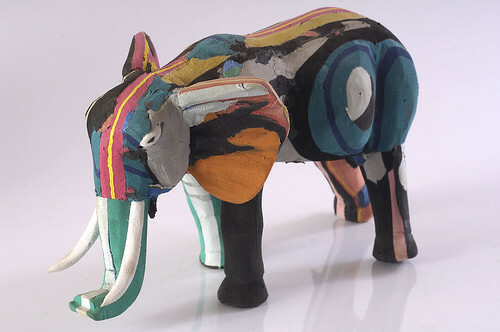 In the hands of creative Kenyans, those discarded chale wote became desirable things: art, fashion and toys. Julie’s company Ocean Sole now makes everything from jewellery to large-scale animal sculptures. 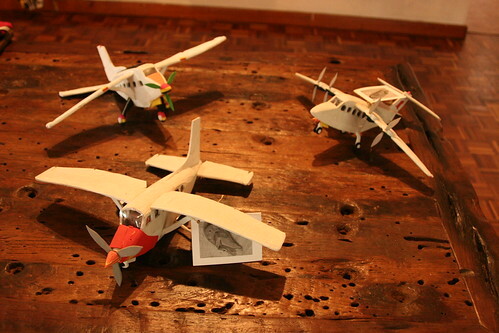 As you can see, its products look fantastic – and they help keep Kenya’s beaches clean too. If children’s homemade toys can grow into all this, how many potential businesses do you think there are in our Galimoto! gallery? Our last Pin of the Week was from Lusaka, Zambia. For our latest we’ve selected a picture from Brighton, some 7,000 miles away in Britain. They’re very different posts from very different places, but both reflect ideas and principles we want to bring to Playtime in Africa. It ticks a lot of boxes that we like: community-level design, sustainable materials, and bags of visual and physical interest. Community design: When we began our planning work for Playtime in Africa last summer, we did it right here in Dzorwulu. Folks of all ages got involved, including young people who represent the project’s end users. Sustainable materials: This summer we’ll be launching a drive for reclaimed wood. It could be a felled tree on your land or a bookcase you no longer want – if you’re in Accra and have something you think we could use, drop us an email. Visual and physical interest: We’re not planning a bare yard and a basic classroom. PiA is about sensory experiences and exploratory play. We want a multi-level environment filled with color and texture. 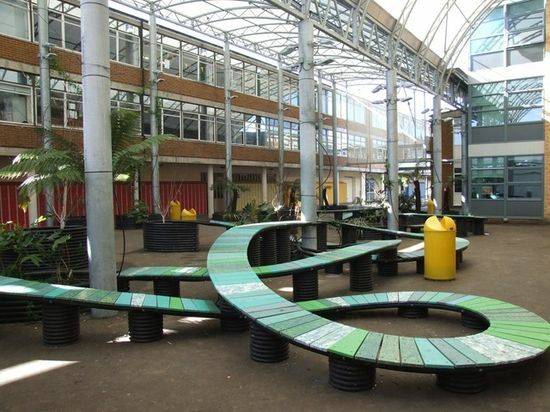 As well as checking out the rest of our ‘seating and shade’ Pinterest wall, take some time to explore the gallery of unusual learning spaces that this week’s pin originally came from. It’s packed with ideas, from a brainstorm room with blackboard walls to a gorgeous tree mural for an outdoor teaching environment. Why is rhyme such an enduring part of children’s literature? Canadian-Ghanaian writer Adwoa Badoe helps to explain its appeal in this video from education site TVO Parents. Some of Adwoa’s contributions put rhyme in a Ghanaian context, so we’ve transcribed a few highlights at the bottom of this post. Check the original TVO page to for some book recommendations from the panel. Adwoa’s choices include Atukei Okwai’s A Slim Queen in a Palanquin, which we recently added to our kids’ booklist on Pinterest. You might also like Tahinta! A Rhyming Play for Children, by Mmofra’s founder Efua T Sutherland. There’s an audiobook sample on the Made by Mmofra page. The numbers are time references. If you don’t have time to watch the whole video, you can use them to go straight to Adwoa’s sections. “I think that it’s the patterns, and also the fact that you can anticipate what’s going to happen. Everybody wants to belong, and to belong you have to know what’s going to happen. “Our languages are more rhythm than rhyme. If I think about the songs and the chants [that I grew up with] you would approach rhyme more through repeating a refrain than creating rhymes. After this Adwoa performs a chant from her book Nana’s Cold Days. “Yes, I did. I think one of the best ways to get into language is to use children’s rhymes. That’s how we learned.